CLARINET SCORES - CLARINET SHEET MUSIC - CLARINET SONG BOOK - NEW CD : JEAN-CHRISTIAN MICHEL PLAYS JAZZ - NEW VIDEOS - NEW SCORES AND NEW SONG BOOK - NEW MUSIC DVD - A SPECIAL PAGE ON THE CLARINET - NEW DVD OF JEAN-CHRISTIAN MICHEL - PLEASE CHECK OUT THE LATEST NEWS ! The impact of JEAN-CHRISTIAN MICHEL on the world of music is wonderful. Thanks to him, sacred music is appreciated by a more and more numerous public. In effect, the clarinettist greatly contributed to it by introducing his numerous arrangements and transcriptions of JS BACH. Jean-Christian MICHEL also wrote superb arrangements of classical music and you have only to remember his extraordinary version of Aranjuez's Concerto or that of Albinoni's Adagio. In addition to his arrangements and transcriptions, JEAN-CHRISTIAN MICHEL has composed a lot of his own works : more than a hundred compostions appear today in his repertoire. His original orchestrations mainly call on the clarinet, of course, but also the organ and synthesizers. Some of his works are dedicated to the piano, such as "Port-Maria", his splendid Concerto, others to the harpsichord, still others to the guitar. Some of them, truly grandiose, are written for choirs and orchestra. 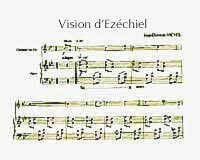 The inclusion of a rhythmic section with bass and drums throughout almost all the music of JEAN-CHRISTIAN MICHEL and the reference to J.S BACH has qualified it as "JAZZ and SACRED MUSIC" "BACH JAZZ" or "PLAY BACH". 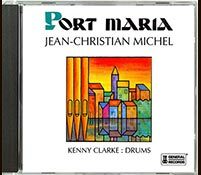 The spatial sounds of synthesizers ( instruments still avoided today by purely classical musicians ), has led the press to qualify JEAN-CHRISTIAN MICHEL's current music as "JAZZ & SACRED MUSIC CROSSOVER"... A futuristic appellation which suits it very well ! JEAN-CHRISTIAN MICHEL's transcriptions for clarinet of JEAN-SEBASTIAN BACH's Chorals of Sacred Music ( works extracted from the "Orgelbüchlein" ) have seduced almost unanimously the elites as well as the general public. By its quality and its originality, the music of JEAN-CHRISTIAN MICHEL has conquered criticism and traveled around the world. 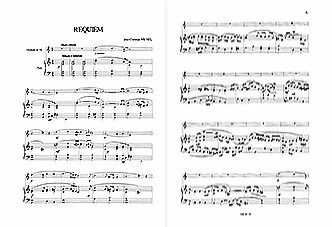  Those who have the chance to play a musical instrument will find in this page "Scores", a selection of compositions for clarinet of JEAN-CHRISTIAN MICHEL's most famous music, in his luxurious Song-books or song sheets. 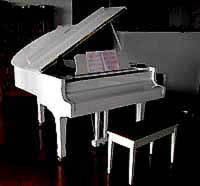 A style designed for piano was chosen for these allowing the greatest number of people to access the composer's music. Those of you who still have in their hearts the unforgettable transcription of Aranjuez's Concerto by Jean-Christian MICHEL, will find the famous arrangement in a 28 pages booklet. Before ordering a score, if you still have not made up your mind, you should listen to some of the pieces ! Go therefore to the JEAN-CHRISTIAN MICHEL's discography. Visit rubricCD, discs and albums. At the bottom of page, you will be able to listen to free samples with RealAudio, or download them in MP3. (illustrated with a lot of photos). REQUIEM - FUGUE EN SOL MINEUR - ORATORIO DE NOËL - KYRIALE - LE CŒUR DES ETOILES - VISION D'EZECHIEL - EVE DES ORIGINES - LES PARABOLES DE L'ESPACE - LE PUITS DE LUMIERE - VIF OBSCUR. 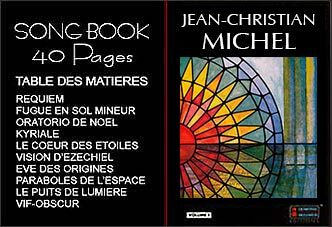 The Song-book of Jean-Christian MICHEL is a luxurious album of 40 coated paper pages, with a hardback four-color process cover. 30 pages of scores for piano, organ, or synthesizer, illustrated with 10 other big pages of texts and photos. The transcriptions for B flat clarinet is published on 10 additional separate pages, so that the clarinettist can read comfortably his part without having to deal with the shoulder of the organist or the pianist. JEAN-CHRISTIAN MICHEL's recordings were realized with a B flat clarinet. However we adopted here a scoring in C, thus favouring arrangement for other instuments such as the flute. The clarinettists will not be bothered by the transposition from C to B flat which they are used to. The organ part has been partly "contracted" for piano, as accuratly as possible without becoming of an insurmountable difficulty. As far as possible, the whole melody is present in it. The B flat clarinet scores joined to the Song Book allow the clarinettist to immediately read at sight his part, without having to transpose, as the professionels musicians have to do it very often. Our friend musician will consequently have the convenience of directly read his clarinet score on his own sound music stand, accompanied by his pianist or organist, who, him, will not have to transpose anything. ORDER THE SONGBOOK OR A SCORE ! SCORES OF CLARINET's TRANSCRIPTIONS OF JOHANN-SEBASTIAN BACH ON FREE MIDI FILES.  MIDI files to listen to, to download or to edit into scores.  Detailed explanations on MIDI music, MIDI files etc. Jean-Christian MICHEL has joined the classical composers, as we call the great musicians whose brilliant creations remain undiminished by time. Nevertheless his music is not "Traditional Classical music", in the usual meaning of this phrase, because if its source is in the patrimony of Occidental Classical music, the Sacred music born of centuries, then it is equally in a contemporary sophisticated Jazz with spatial echos. Jean-Christian MICHEL had intended on a career as a surgeon and obtained his diploma with the congratulations of the Jury. However, during his studies, he dedicated all his leisure time to Music : Initially, at the conservatoire, then learning at the school of the grand masters such as J.S BACH, and also of composers like DEBUSSY, RAVEL, SATIE, VIERNE and Jehan ALAIN, he quickly acquired a mastery of writing. Gradually, his own artistic expression, "JAZZ & SACRED MUSIC CROSSOVER", a synthesis of Jazz and Classical music, took him :The appeal of the music becomes authoritarian, the surgeon abandons the operating room for musical composition. Jean-Christian MICHEL can from then on, devote totally himself to his real passion and dedicate his life to Music. Quickly promoted to "Full Member of the SACEM" ( Association of composers and music publishers ) he shares his time between composition, the recording studio and concert tours. Jean-Christian MICHEL speaks an authentic language, which comes directly from his art. His compositions, which are unique, are built upon simple and direct melodic lines, with refined harmonies and original rhythms. Furthermore, Jean-Christian MICHEL's musical universe seems to join the deep current of our time : his music does not address the minority, but the whole of humanity. Jean-Christian MICHEL's work has been rewarded by numerous prices, of which that of "Sciences and Culture" given at the Sorbonne by a jury consisting of 6 Nobel prizes-winners.